Neutralizes odours. Freshmatic auto spray refill. 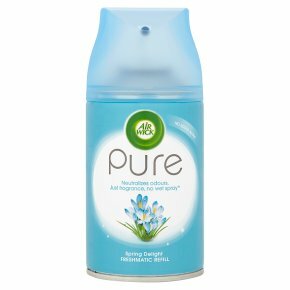 No added water.Just fragrance, no wet spray* *compared to traditional Air Wick aerosols 60 Days of Fragrance** **Based on usage at 32 minute intervals Air Wick Freshmatic Max Pure Spring Delight releases bursts of fragrance to constantly freshen your home and neutralize odours. No wet spray so you can enjoy more fragrance in the air and less on the floor. Set device to off before inserting refill. Always direct away from face. Switch on - device sprays after 15 seconds.